The house style provides extra space along the sides of the enclosure, with maximum height near the center ridge. The pre-drilled frame is easily assembled with minimal handtools. All frame components are made from heavy duty galvanized steel. 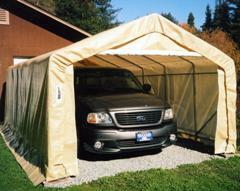 Main cover and doors are made from long life UV Resistant, Fire Retardant Polyethylene with woven backing. Two Box Shipment - easily unloaded and transported. Anchors Six ( 6 ) 36" Anchors with U-Bolts & 36"Drive Rod Std.